Perhaps a dash of blue. After an eventful season of marital bliss, things are slowly settling back into some semblance of routine. 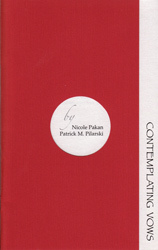 My new wife Nicole Pakan and I are thrilled to announce both our recent marriage, and also the birth of a collaborative creation: the chapbook Contemplating Vows (Katabatic Books, 2011). We hope you enjoy the result! As written in the book summary: "Nicole Pakan and Patrick M. Pilarski met through the Edmonton poetry scene, where a profound respect for each other's writing evolved into a light-hearted romantic adventure. Four years later, they finally took the plunge ... and authored this collaborative chapbook. [...] In March 2011, they were happily married (to each other, of all people)." Should you choose to partake in the hand-made textuality that is Contemplating Vows, it can be ordered directly from the authors, or from the publisher (katabaticbooks@gmail.com), while supplies last. Please use the purchase inquiry form to submit your contact information and the number of copies you would like to purchase. We will get back to you shortly after we receive your query. List price is $10, with free shipping and handling. 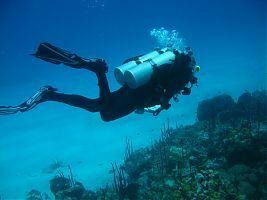 Back to a point of flux; the present; all things swimming forward. A huge thanks to RATTLE Magazine for publishing some of my work in their recent feature on Canadian poetics, and to Matrix Magazine for including visual pieces in their dossier on Zen poetry. The Edmonton Poetry Festival was once again a whirlwind of literary excitement (and at times hair product). My vast appreciation to Glenn Robson and the festival for featuring some of my Recoil series in synesthesia: unframed, unbound(ed). On the home front, Icelandic sagas are being reinterpreted and recast—the new book, blackstone/saga, is ripening toward its final form. It looks jagged, glacial; there is steam coming from the cracks. Stones are being dragged from the bay. I look forward to seeing where they come to rest. Thank you all for your patience, compassion, and warm wishes these past few crazy months, and for being part of the journey so far.